The versatile Winco PUT-12C Polycarbonate Utility Tong, Clear 12" will have many uses at your hot or cold food bar. From serving salads to pastas, to rolls and muffins, this clear utility tong with mid-sized serving ends and flexible spring mechanism, can enable customers to serve themselves with ease. 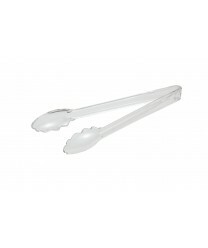 The durable polycarbonate construction ensures that these tongs are virtually break-resistant and dishwasher safe.